OUR OTHER CURRENTLY FEATURED BOOKS, “TWIN OAKS,” BY MELISSA PALMER AND “WAKE ME UP,” BY JUSTIN BOG, CAN BE FOUND BY SCROLLING DOWN BELOW THIS POST, OR BY CLICKING THE AUTHOR’S NAME ON OUR AUTHOR PAGE. THE BOOK: A Greater Monster. SUMMARY: A psychedelic fairytale for the modern age, A Greater Monster begins in our reality but takes you on a darkly poetic trip into a radically twisted alternate reality that reflects civilization like a funhouse mirror. The central character, a nihilistic ad executive, finds himself thrown into this other world with amnesia and physically transformed to the point where is utterly lost. He struggles to survive as he encounters sphinxes, gods, living skeletons, witches, and quite possibly the strangest circus ever imagined. A Greater Monster also features graphic design, 65 pages of illustrations and secret links to web experiences featuring original music and animation that connects to scenes in the story. THE BACK STORY: I spent seven years writing A Greater Monster. For roughly the first half of this time, I was generating the raw material of the story, writing exclusively in notebooks. By the point I had filled up a dozen notebooks with scenes, characters and ideas, I could see the entire story in my head without having planned it out. During the second half of those seven years, I moved to editing. I mapped out the storyline and entered all my work into the computer. I began revising and refining and went through fourteen drafts, making new connections and discoveries as I went. The multimedia elements arose as ideas as I discovered what the primary themes and symbolism within the story were. I had not planned any of it in advance; they just grew out of the material organically. WHY THIS TITLE? : “A Greater Monster” is a reference to the quote from the essays of Michel de Montaigne, “I have never seen a greater monster or miracle in the world than myself.” The main character goes on a journey both physically, emotionally and mentally to discover who he is inside and what offers him a reason to live. 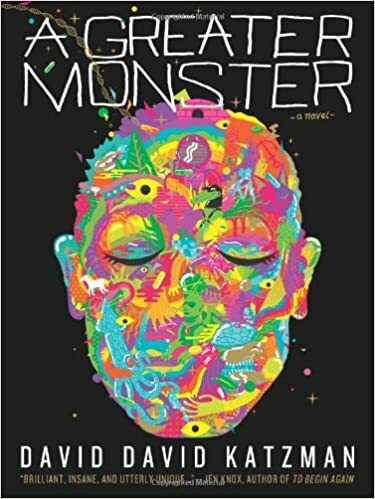 He encounters many miraculous monsters and monstrous miracles along the way, and this experience invites the reader to decide what “monster” means and how it relates to our own selves. WHY WOULD SOMEONE WANT TO READ IT? A Greater Monster is an immersive, surreal, and poetic journey into a bizarre universe. It presents much to discover and intuit from multiple readings and opens new connections the closer it is read. For a reader willing to be absorbed by it, it is a performative experience that breaks the boundaries of a typical literary experience and is wholly original. Called “One of 10 books every Chicagoan should read” by Refinery29.com. Named a top 10 book of 2012 on The Common Ills blog. “I can’t express how brilliant my favorite scenes in A Greater Monster are. In this extraordinary work, Katzman pushes language to do things, which are truly astounding.”—Carra Stratton, Editor, Starcherone Press. “Intelligently written and displayed, A Greater Monster is truly like no book I have ever read before. While visions of Alice in Wonderland strayed through the back of my thoughts, this book is so much more. I admire David David Katzman’s creativity and the amount of work that must have gone into creating such an exotic literary gift for readers who like to read beyond the lines of contemporary fiction.”—Paige Lovitt, BLOGCRITICS.ORG . 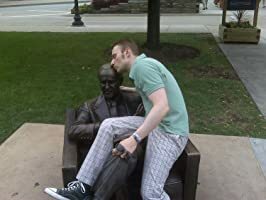 AUTHOR PROFILE: I’ve published two other books, an absurdist satire entitled Death by Zamboni and a collection of stream-of-consciousness emails and handwritten letters, The Kickstarter Letters. I have a BA in English Lit from The Ohio State University and a Master’s in English Lit from University of Wisconsin-Madison. In addition to writing, I’ve always enjoyed contemporary art, street art, drawing and painting. After grad school, I spent five years as an actor and improviser as well. And a while back, I started improv again and had a team that performer around Chicago weekly for a couple years. I seem to be attracted to creating art and being creative in all aspects of my life. AUTHOR COMMENTS: I supposed you could call me an “experimental” writer although I don’t consider my books experiments. Rather, I’m pursuing originality. Trying to create something that is unique in more than just the story but has some qualities in structure and content and style that has never been created before. It’s carried in the Chicagoland area at Chicago Comics, Quimby’s Bookstore, After-Words Books and The Book Table. It’s carried in New York City at The Strand Bookstore.